August has been an okey kind of month for me. You can read more of what happened to me last month in my other blog post entitled Goodbye August, Hello September. One big move for me will most probably be getting a life plan through St. Peter. Read: St. Peter Life Plan: Is it Worth the Investment. 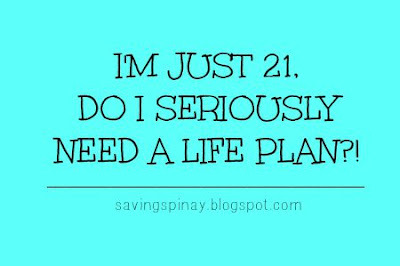 "I'm just 21, do I seriously need a life plan?" That is exactly the question I contemplated the night before signing the documents given my mother. (She is already done with her St. Peter Plan and became the biggest factor why I chose to get mine). You see, when you are just 21, all that's in your mind is starting your life and not the other way around. Instead of approaching the end of your life, you are full of hopes and dreams of a better future. But the 20’s is the perfect stage/phase in life to build a strong financial foundation. You have less responsibilities, you have all the energy to diversify your income and you are more focused in your career. Investing in a life plan even if you are only your 20’s can be considered as a wise decision. What is a Life Plan anyway? Life plan also known as memorial life plan is a type of plan sold by pre-need companies. It is a product that enables the plan holder pre-pay future memorial services at a lower cost today. For Filipinos, a life plan is an unlikely investment. It feels so morbid to own one. Someone even told me na parang tinataningan mo yung buhay mo. But dying without a life plan (especially when you and your family is unprepared) would mean a major financial and emotional disaster. Imagine making big decisions while mourning for your loved one? You'll worry about the ready casket for the deceased, the chapel or mortuary, who will pick up the body from house or hospital and the embalming process. Processing papers like death certificate will also be part of the procedure. Dying without a life plan may cost 70,000 to 90,000pesos when a life plan has the most basic package the starts with 35,000pesos and can be paid in monthly installment. A Life Plan in Your 20's? I am honestly quiet hesitant when I am signing up the paper. Deep inside I know that it is an important one but I do feel like I am too young to have one for myself. But the security and convenience that a life plan will give is priceless. Kailan ka ba bibili ng life plan kapag malapit ka na mamatay? Or worse at the date of your death already. Life plan is transferable meaning it can be passed on to others in case of need. It also has built-in coverage wherein if the plan holder dies and the plan is not yet paid fully, the balance is waived and you will still get the complete memorial benefits. Securing a pre-need plan is a sure way to get the memorial service you need in the future at the lowest price possible. It is a great gift you can give for yourself, your family and your future family. Last Thursday, September 10, my Tita died. It was so sudden and a first in the family. My Tita's family wasn't prepared. They availed the only memorial service available even if it took 15 hours of waiting for my Tita's body to arrive. Then we were surprised that my cousin (Tita's daughter) availed a life plan but didn't know where my Tita kept it. My Tita's family could have saved a lot of money. Lesson learned: Keep a reliable safe-keeping to all documents and make sure everyone in the family knows where to look for things in case of emergency. Losing a love one is a painful experience. I see my deceased Tita and I remember my Mama and Papa. I want to give them the best memorial service they deserve and I am thankful that they have managed to avail one for themselves since we are still young. I know my parents also wants the best for us, their children. And a life plan will put a smile on their face. Just five years of financial sacrifice and we can focus on other investment. At the end of the day a strong faith in God is the most reliable investment ever. Managing Your Money: A Beginner's Guide - New! More Proven Ways You Can Diversify Your Income - New! 1 comment on "I'm Just 21 Do I Seriously Need a Life Plan?" I think, if the pocket can, everybody should consider getting life plan as soon as possible. We got our at a pre need company called St Peter Life Plans.